Thank you James Naismith for inventing the wonderful game of basketball in 1891. It’s more popular than ever. 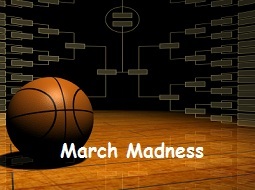 Because of Naismith, March Madness is once again here! The madness started last Sunday with 68 college basketball teams selected and dreaming of winning it all … a coveted national championship. While I seldom write about sports on my Growth Coach Blog, this time is an exception. I am a college basketball fanatic and love watching the game all season long, but especially during the national tournament. Let the madness, drama, and business lessons begin! Let me explain my love for college basketball and what it can teach business owners before you declare me a total nutcase. I love watching the game, the drama, the cheering fans, the players giving it their all, and the coaches working hard to get the most out of their teams. It is a simple, pure and fun competitive game to both play and watch. It’s fast paced, graceful, powerful, exciting, with plenty of scoring (unlike soccer or hockey) and players need to play both offense and defense … and that can switch in an instant. As a business coach, I love college basketball because it’s a microcosm of life and business … the planning, practicing, competing, coaching, attacking, defending, adjusting, playing as a team, winning, losing, bouncing back, and having fun. It can teach coaches, players, and viewers so much about life, competition, striving and improving. Additionally, in sports and business, the score seldom lies … how rigorously you prepare, strategize, lead, execute, and hold your team accountable more often than not determines your performance … your bottom-line results. With today’s slow economic recovery, the game of basketball can teach us business owners and business coaches additional valuable lessons. By watching tons of conference tournament games last week leading up to the NCAA national tournament, I had a few business coaching revelations. The major revelation was that BALANCE is essential in both successful sports and small business management. As a business owner, like a head coach, you must have balance on both sides of the business like both ends of the court … playing good defense and good offense. You can’t be weak with either one and truly expect to compete and win. Balance is essential. And finally, as the business leader (head coach), you must maintain emotional balance and not let your employees (players) see you lose your confidence or composure. Even under the glaring lights and during pressure situations, you cannot let others see you sweat. You must remain a confident and cool leader. How are you doing in that regard? The various basketball teams I truly enjoy watching (Xavier, Duke, Ohio State, Notre Dame, Kentucky, Butler, North Carolina, Wisconsin, Richmond, Gonzaga, etc.) have a very balanced attack … on most given days/nights. These teams have bought into their coach’s system and play very hard and play as a team … on both offense and defense. They not only work hard to put sufficient points up on the scoreboard, but they work darn hard to prevent their opponents from doing the same … they play in-your-face defense, help-out team defense, and rebound like crazy. The teams that tend to lose may do well at offense or defense or even both at certain times but generally don’t do both well for 40 minutes of play. They are inconsistent. How about your business? So, as your personal Growth Coach, let me ask you a few business coaching questions. First on the offensive side of the court. As the head coach of your business team, are you playing both solid offense and defense? Is it a balanced and consistent attack? In the marketplace battle, are you focusing enough on offense … running your sales and marketing plays? Are you and your company doing everything you can to put sales numbers up on the board? As head coach, are you holding your sales team accountable for results instead of excuses? Do you have enough of your team members specialized and focused on generating revenue for the company? Have you freed them up from too much paperwork and clutter to go out there and score? Are you continuing to invest in sales and marketing resources during this tough economic game? Now is not the time to simply play defense and cut your costs and losses. As your business coach, I urge you to do both. In the marketplace arena today, I see too many business owners focused only on playing defense. They think they can wait out the competition or tough times. Instead of trying to win, they are playing not to lose … big mistake! They act as if they simply want to survive by waiting out the game clock. They think they can simply cut expenses and achieve a victory. While it’s smart to have a strong defense and seriously review your expenses, head count, budgets, cash flow situation and make wise adjustments, you cannot simply cut your way to success during slow economic times. While wise cost management (defense) can be a solid foundation, you need a balanced attack. Yes, by all means cut expenses wherever necessary but do not cut back on your sales and marketing efforts. You must stay on the offensive attack and use every player and play in your arsenal. Do not get too conservative with your offense or too predictable. Mix it up. Test some new plays. Try some new players. Borrow plays from other winning programs. Bottom line, you must score to win. As a business coach, another trait I see in common with most winning basketball teams is that the head coach tends to keep his emotions in check, most of the times, even during the heat of battle and even if they are behind on the scoreboard. The winning coaches seem to maintain an emotional balance and maturity and demand the same from their players. Yelling on occasion to make your point is good coaching, yelling all the time is plain crazy. Again, a balanced attack and a balance of emotions … not getting too high or too low with the emotions no matter what is happening during the game … seems to be a common train of great leaders. They tend to stay cool, calm and confident. However … you can always find an exception to this rule and a winning coach who constantly screams, rants and raves … but they tend to sound and look like idiots in the process. As your personal Growth Coach, here are some more business coaching questions for you. As the head coach, are you keeping your poise and head in the game? Are you setting the example of being focused and intense while remaining calm and collected? Do your employees see you sweating and full of doubts or do they see you positive and confident? Don’t forget, you set the team mindset by your leadership behavior. Even if you are a bit nervous on the inside, do not show that on the outside. Even when you have a down day, do not bring your employees down. As the head coach, you must maintain your confidence and keep your faith. Remain optimistic that your team can win the game, even if you are behind on the scoreboard. As long as there is time on the clock, you can always come back strong. No matter how tough the competition or economic circumstances, you and your team can win the game of business. Keep things in perspective and try to have fun. And, coming from your business coach, don’t forget to maintain a balanced attack and your emotional balance. Onward to victory!! This entry was posted in Business Coaching and tagged benefits of business coaching, business coach, business coaching, business coaching advice, business coaching guarantee, business coaching tips, business owner, business owner mindset, business systems, college basketball, delegation, entrepreneur, Growth Coach, leadership, march madness, marketing, small business management, strategic business owner, strategic mindset. Bookmark the permalink.